If you are in search of some spooks, then you will find that Northumberland has plenty to offer. 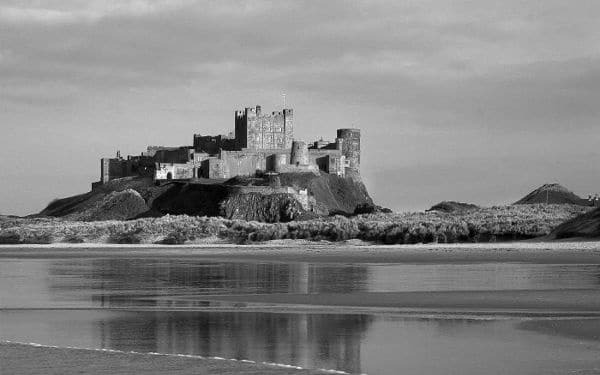 Bamburgh Castle has long been a focal point when it comes to views of the Northumberland coast and it has featured in countless paintings, postcards and photographs over the years. The first references found to the castle date back to 547 AD, so it certainly has a long history behind it! It is no surprise then that it is reported to be haunted by multiple spirits! Among the ghostly residents haunting Bamburgh Castle there are said to be two colourful female spirits. First is the Pink Lady, a heartbroken young lady who saw her love sent away for seven years by her father. Her father tried to make it up to her by purchasing her a new dress in her favourite colour – pink. However, the young woman donned her new dress and then promptly threw herself from the castle onto the rocks below. Ever since, her spirit has returned every 7 years to search for her love – always while wearing that pink dress! The other lady is the Green Lady who appears wrapped in a green shawl and carrying some kind of bundle down the stairs. She always falls on the stairs and when witnesses rush to her aid they find that she has disappeared! There have also been various other reports of supernatural activity including a spectral knight, a ghostly soldier and several misty or shadowy figures appearing in different parts of the castle. Visitors often report hearing whispers, footsteps and other unexplained noises. They have also been touched by invisible hands. Holy Island has a very colourful history and it is now highly recognisable as one of the most photogenic locations in the UK. It is also said to be haunted. 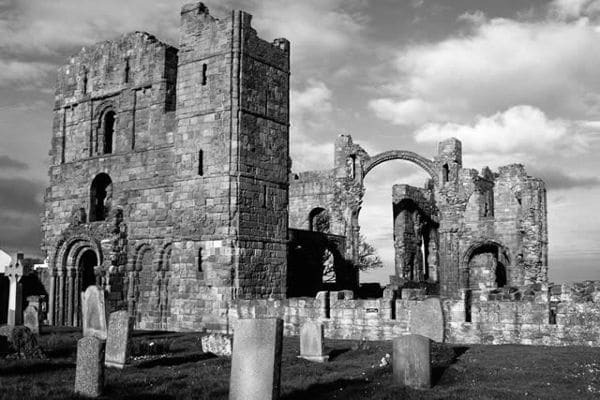 In 635, St Aiden founded Lindisfarne Priory on Holy Island. In 664, St Cuthbert visited the island for the first time and was consecrated as Bishop of Lindisfarne in 685. When he died he was buried on the island, but years later his casket was reopened and his corpse was found not to have decomposed which resulted in hundreds of people making a pilgrimage to Lindisfarne to visit it. However, the monks feared invasion from the Vikings and relocated the body and some other important relics. Today, there are tales of St Cuthbert’s ghost wandering the island dressed in his simple robes. He has been seen in the grounds of the priory and the castle as well as sitting by the shore fashioning what is known as ‘Cuddy’s Beads’, which are actually fossilised sea lillies which were strung together and used as necklaces or even rosaries. The Bishop is not the only apparition that has been spotted on the island. There have also been reports of a soldier from Cromwell’s time being seen in the castle and several apparitions of monks in the priory grounds. 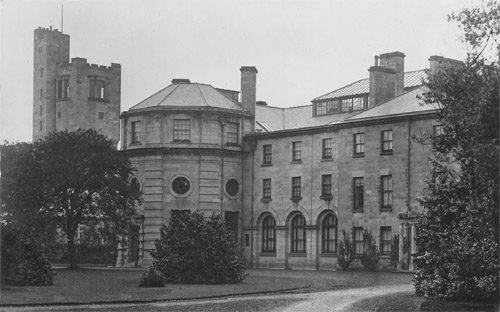 Haggerston Castle is not the first place you might think of when asked about a haunted location. It is best known for being a family holiday park operated by Haven. 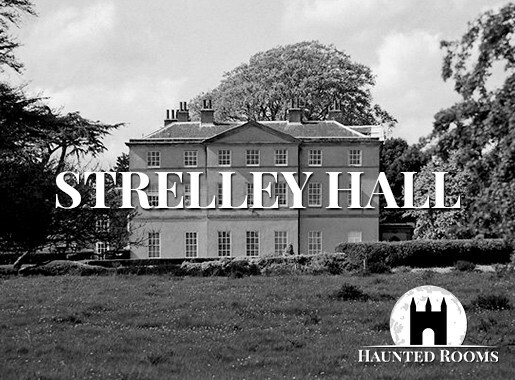 However, it is actually one of the most haunted places in Northumberland. The castle dates back to at least 1311, although early records were lost in a series of fires. It is believed that the original occupants of Haggerston Castle were the de Hagardestons and part of William the Conqueror’s invasion force. Today, only one tower and a rotunda remain. Staff working at the holiday park have reported that they frequently spot a little girl in Victorian clothing running around. She mostly seems to appear near the remains of the castle. There have also been reports of unexplained noises and electrical equipment being turned on in various parts of the holiday park. The park has also had several fires which are said to be the result of a witch’s curse! The Schooner Hotel in Alnmouth, Northumberland was originally built in the 1600s as a coaching inn and over they years it has hosted a plethora of smugglers, murderers, vagabonds and other scoundrels. 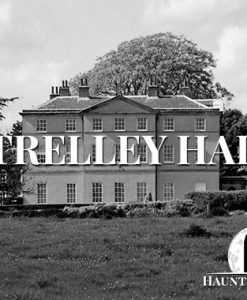 The history of the building is peppered with tales of suicide, murders and massacres so it is no surprise that this is one of the most haunted places in Northumberland. In fact, at last count there were over 60 spirits haunting the rooms and corridors of The Schooner Hotel! 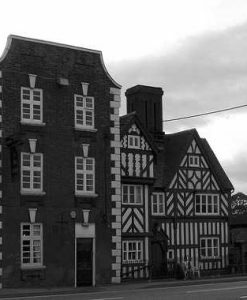 The Schooner Hotel has been named the most haunted hotel in Britain, with over 3000 paranormal reports on record – and that’s just from recent years! There is little doubt that there are ghosts here! That many incidents just cannot be explained away! We obviously cannot go over every single ghost that resides here, so instead we will just summarize a few of the popular ones. In room 28 there are various chilling tales of suicides and murders occurring in the room. Guests have heard children’s voices and also the sound of them crying and women screaming. Visitors will often comment on feeling overwhelming fear inside the room and a feeling of not being alone! Room 20 is equally scary it seems with a dark figure who darts out of the room and banging into the fire doors opposite the room. This in itself is terrifying, but some visitors say that if this shadow figure notice you it will turn towards you and start moving very quickly. All of the guests who have experienced this left equally quickly so we cannot say what happens if it ever catches up to you! Rooms 16 and 17 have also been the sight of a variety of different apparitions. 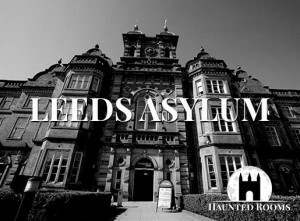 Some guests have woken to find a ghostly figure staring at them from the end of the bed in these rooms and sometimes the same figures are seen in the corridor. There is also a little boy who runs down the corridor knocking all of the doors. At one time these rooms would have been connected by a secret door! Another chain of connecting rooms is rooms 28 through 30. In these three rooms there are various unexplained sounds including knocks, bangs and whispers. Guests also report feeling sick and/or dizzy in these rooms. 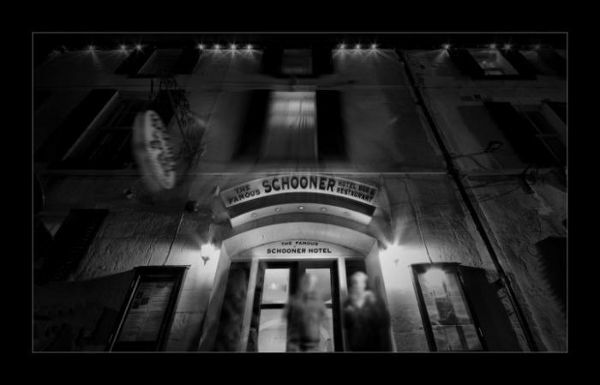 The Schooner Hotel has 32 rooms and all of them have been subject to some paranormal activity. Do you dare to spend the night? 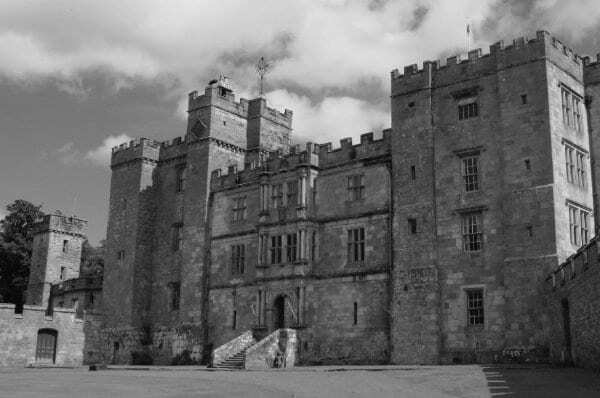 Chillingham Castle has a rather disconcerting torture chamber and suite of dungeons which should be the first hint that this is one of the most haunted places in Northumberland! Since the 1200s the castle has been continuously owned by the Earls Grey family. Aside from the family, there are also a number of Northumberland ghosts that also call the castle home. One of the most famous of these ghosts is the ‘Blue Boy’. The Blue Boy is a famous apparition at Chillingham Castle, although he doesn’t seem to appear in the history books. He was frequently heard crying out either in pain or in fear around midnight. The noise seemed to emanate from the thick tower wall in the Pink Room. Shortly after the cries rang out, a halo of light would appear and sometimes an old fashioned four poster bed also became visible. Standing behind it was the shimmering apparition of a little boy, all dressed in blue. In the 1920s, work began to cut through the tower wall to create a passage to the rooms their when the workmen discovered the bones of a child along with some fragments of blue cloth. The boy was given a proper burial, and the wailing ceased. However, from time to time a halo of blue light does appear in the room. There are many other ghosts in the castle aside from the blue boy, one of which is ‘The White Pantry Ghost’. She is seen in the inner pantry and appears as a frail, extremely pale lady in white. She has been spotted for centuries always in the same manner. The first recorded instance happened back when the silver was stored in the pantry and guarded by a footman. The guard was about to fall asleep when a woman appeared and begged him for water. He believed her to be a guest and went to find her water, only to suddenly realise that he was locked in and nobody could have entered! She still appears regularly today in the same manner. Some have said that her thirst could indicate that she died of poisoning. 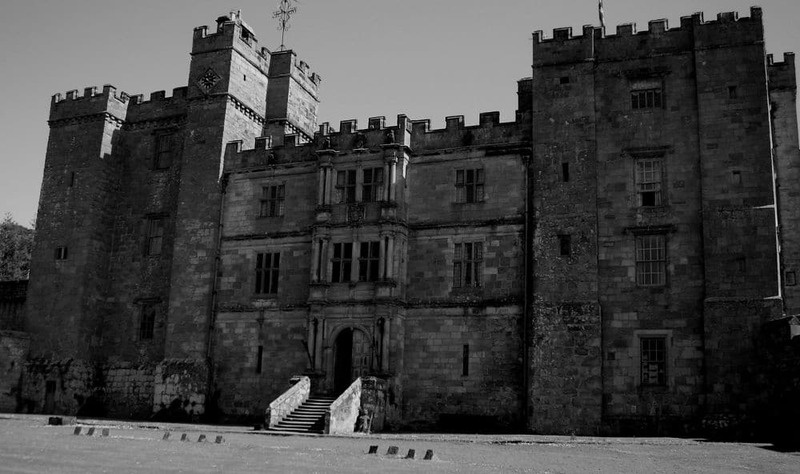 Other ghosts and unexplained activity in Chillingham castle include disembodied voices talking to one another, a dark creeping sensation in some areas which are said to have an oppressive atmosphere, Lady Mary who is said to wander the corridors in search of her husband and a tortured child. If you would like the opportunity to meet some of these many ghosts, then you might want to join us on a Chillingham Castle ghost hunt!